I grew up on eating ice cream for dessert most nights. There were always a couple of cartons of ice cream in the freezer. A few times each summer, my parents would pile us all into a car and drive us to Swenson’s where we could each pick out a single scoop of any flavor we wanted. My brother introduced me to Ted Drewes as a pre-teen, driving me and my best friend from our suburban neighborhood to the packed parking lot of people young and old eating frozen custard concretes, so thick it could be served upside down. As a teenager, the first places I leaned to drive to in the city was Ted Drewes. I always went for the richest chocolate I could find. 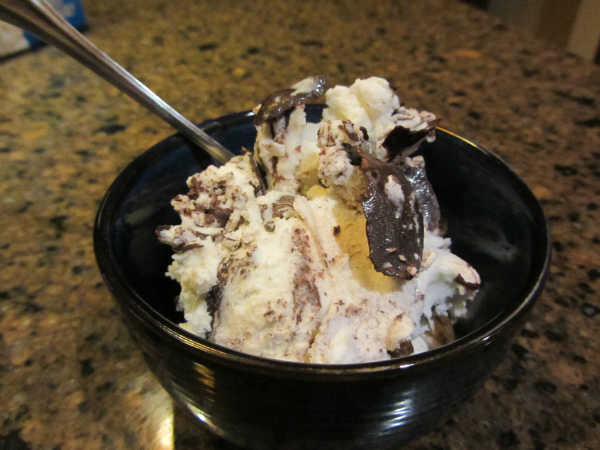 As I got older, I switched to cookie dough ice cream or chocolate chip. In more recent years I’ve become a fan of Maggiemoos cake batter and fresh banana ice cream with chocolate chips mixed in. While I can appreciate Fro Yo’s wall of flavors and buffet of toppings, I’ll always go for hard ice cream with mix-ins of your choice over premixed flavors or soft-serve given the choice. Even as a kid I liked Baskin Robbins over Velvet Freeze. I don’t eat ice cream as much as an adult as I did as a kid. Once in a while I’ll pick up a carton at the grocery store. But, most of the time, grocery store ice cream just doesn’t stand up to what you get from a place like Maggiemoos and Oberweiss. Last week, as I was looking through the dozens of choices at my grocery store, I looked at the old fashioned half-gallon paper cartons. I don’t usually get ice cream in these cartons. I don’t know why, but the round containers just seem more likely to have premium ice cream bursting with flavor. 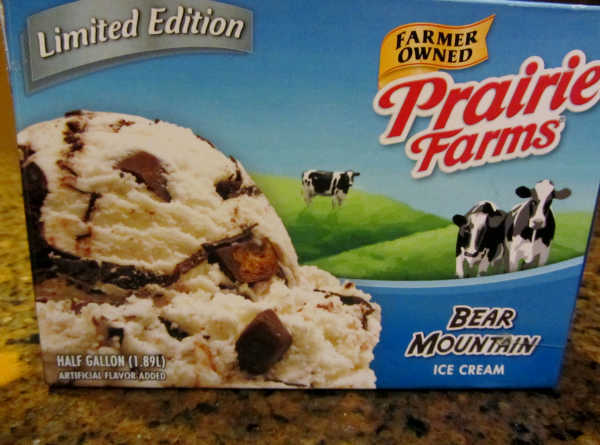 But one carton caught my eye this time and given my inclination to support the local food movement, I decided to pick up the limited edition Bear Mountain flavor by Prairie Farms. This ice cream is wonderful. It combines vanilla ice cream, chocolate shell like you get on a dip-ice cream cone and peanut butter cup pieces. Seriously, I AM so disappointed that this ice cream is a limited edition. Maybe I should stock up before it disappears. If only I could find someplace outside of my house to store it….I don’t think I’d have the willpower to stay away if the cartons were in my kitchen freezer.